COARE — Connecting people with the ocean: To ban or not to ban, that is the question . . .
To ban or not to ban, that is the question . . . The fact that many shark populations are in sharp decline is probably no surprise to most ocean advocates. Luckily, this fact is also becoming more widely understood in mainstream circles; however, because of the urgency of this matter, this message needs to promulgate even more rapidly than it already is. Sharks are one of our oceans' top predators, keeping the entire ecosystem in check. They are an essential component of the foodweb, and are vital to the health of our oceans. Studies have shown that reduction in one species causes effects on other species, and sometimes these effects are unexpected and detrimental to local and regional economies. Animals at the top of the food chain, such as sharks, have few natural predators, are slow to mature, and have very few young. Some sharks take up to 25 years to reach sexual maturity, have a long gestation period (upwards of a year), and only have a few offspring in the end. As a result, they are extremely sensitive to fishing pressures, and are slow to recover from overfishing. Many shark species have declined in population by more than 90% in the last 50 years. Some species may have declined by as much as 97-99% in the last 35 years. In other words, as few as 1 out of 100 may be left of some species. Does that register yet? Sharks are often caught accidentally (called bycatch) but sadly, they are also sometimes targeted intentionally by fishermen for their fins. 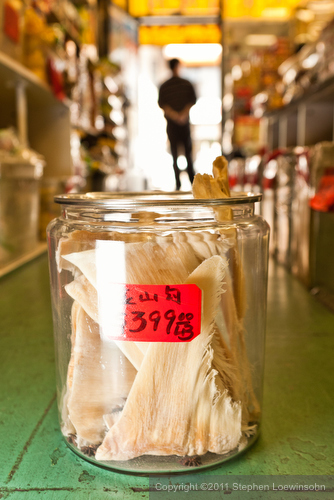 Shark fins are highly valuable and can fetch $600 a pound or more in the shark fin trade. The demand for shark fin drives almost all shark deaths, and because of the relatively worthlessness of the meat, the abominable practice of "finning" occurs to save valuable space on the boat for more profitable profitable catch. After their fins are cut off, sharks are often thrown back into the water where, unable to swim and bleeding to death, they suffer a slow and torturous death. 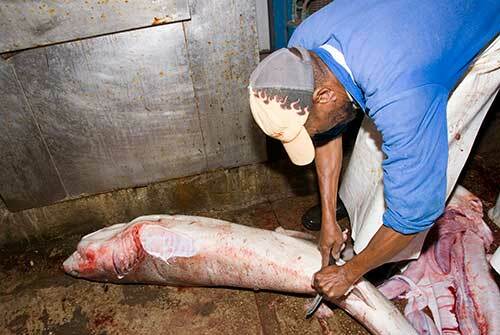 Anyone who has seen videos or photos of shark finning knows that it is an absolutely cruel and horrific practice. Not only is it barbaric, but it is terribly unsustainable, and nations all around the world have banned shark finning, and some have even banned shark fishing entirely. However, that is not enough. Sharks are still being taken and are still being finned – even in world heritage sites, in marine sanctuaries, and in shark sanctuaries. Fishing regulations and marine protected areas are extremely important, but when there is enough demand, poachers will exploit loopholes and remote locations with equal fervor. For situations like this, trade bans work well to end demand for rare, exotic, or luxury items like ivory and shark fins. 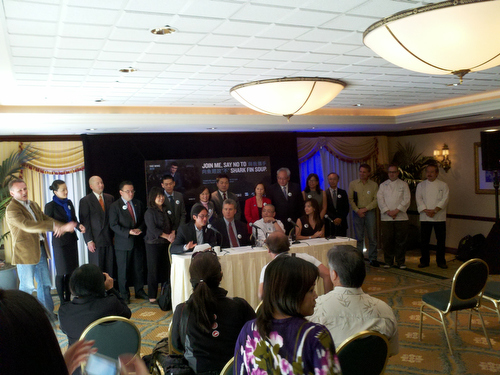 In January 2010, Hawai'an State Senator Clayton Hee blazed a new path by introducing SB 2169, a bill proposing a ban on the sale, possession, and distribution of shark fins in the State of Hawai'i. As the first of its kind, it's understandable that the bill would see a myriad of proposed amendments, and the bill underwent many revisions along the way. 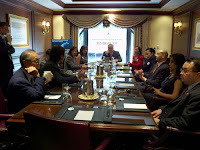 However, in the end, SB 2169 received overwhelming support, passing unanimously in the Senate (25-0) and receiving only one single vote of opposition (50-1) in the House of Representatives, from Representative Jon Riki Karamatsu. Interestingly enough Karamatsu voted in favor of the original bill prior to its amendments, so presumably he was simply uncomfortable with the revisions. The Bill was signed into law on 28 May 2010 by Governor Linda Lingle. The Commonwealth of the Northern Mariana Islands (CNMI) was the next to take up the battle with House Bill 17-94. The Bill passed unanimously in both houses (House: 17-0; Senate: 8-0), and was signed into law on 27 January 2011. Guam's Legislature passed its version of the ban with Bill 44-31, voting unanimously (15-0). Governor Eddie Calvo signed that bill into law on 09 March 2011. Stateside, Washington Senate Bill SB 5688 blazed through both houses, with the Senate's unanimous support (47-0), and near unanimity in the House with an overwhelmingly positive vote (95-1). The sole Nay vote was cast by Brad Klippert, who explained to me that he voted against this bill in an attempt to express his interest in protecting local salmon populations. He felt that voting to protect sharks would be a vote against salmon, since some sharks do eat salmon. I'll have another conversation with him soon, but I think he may have misunderstood the intention and scope of this bill. In any event, Washington's legislation will become the first in the continental United States to ban shark fins, as Governor Chris Gregoire intends to sign that bill into law this Thursday! Oregon's version of the Bill, HB 2838, recently enjoyed unanimous acceptance in its House of Representatives (44-0), and we're assured by the author's office that, if the members of the Ways and Means Committee were present, the roll would have reflected a 60-0 vote. If we consider all of these votes, it is abundantly clear that there is overwhelming, and nearly unequivocal, support for and interest in banning shark fins. In all the votes cast in all the States and Territories thus far, there were only two "No" votes, and neither was cast because they thought shark fin soup was a good idea. 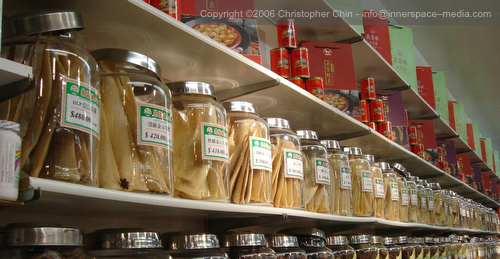 So why is there resistance or controversy to ending shark fin sales in California? One might suggest that there are more substantial populations of Chinese-Americans and other Asian-Americans in the San Francisco Bay Area and in Southern California. Some people are resistant to change, and that is understandable. However, we find that many people who like their shark fin soup simply do not know where it comes from, the impact it has on the environment, or the potentially harmful effects it might have on their health (thanks to methyl mercury and other accumulated toxins). If more people understood these things, and the critical role that sharks play in the ocean, they would likely make the correct choice with little hesitation. In fact, more people understand this issue than the opposition to AB 376 would like you to think. Two weeks prior to the bill's introduction, a poll was conducted among a random sample of California voters to find out their thoughts about shark fins and the practice of shark finning. The vast majority of voters (82 percent) expressed concern about the impact of shark finning. Even more Chinese-American voters were concerned – 86 percent. 76 percent of all those surveyed, and 70 percent of the Chinese-Americans all supported a statewide ban on shark fins. That's not to indicate that the remainder opposed a ban; among Chinese-Americans, only 18 percent of voters oppose the ban and 12 percent expressed no opinion. So, again, why so much resistance in California? 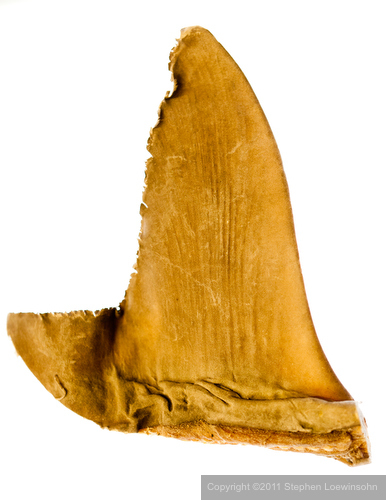 We might also consider that the bulk of U.S. shark fins imports pass through ports in Los Angeles and San Diego. Perhaps the resistance is more likely financially motivated. Those who sell and trade fins certainly have an investment to protect, and it is simpler to keep going about business as usual. However, any choice to continue deriving profits from shark fins is short-sighted, as sharks protect and promote overall ocean health. If sharks disappear, the scarcity of other seafood products will soon follow. There are some interesting arguments in opposition to AB 376, and I would like to address each in turn. 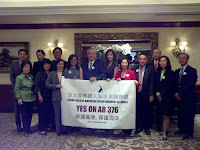 Claim: AB 376 is racially motivated, discriminates unfairly, or targets Chinese-Americans. Truth: AB 376 was authored by a Chinese-American, and enjoys the support of an overwhelming number of Chinese-American groups and individuals, including prominent elected officials and two of San Francisco's own mayoral candidates. To claim this is racially motivated is absolutely preposterous. While the bulk of shark fins in California may be consumed by Chinese-Americans, that is irrelevant. Shark fins are simply a product that is decimating our shark populations and destroying our oceans. Claim: AB 376 fuels anti-immigrant or anti-minority sentiment. Truth: While Chinese-Americans consume more shark fin than other groups, asking them to stop is not discriminatory or defamatory to that, or any other group of minorities. In fact, it gives people the opportunity to do the right thing. This is a chance for Chinese-Americans to shine - to evolve beyond an outdated practice. Just as footbinding and indentured servitude are no longer tolerated, shark fin soup should be similarly eschewed. What may, however, inflame potential anti-minority sentiment, is a stubborn insistence on selfish adherence to a practice that is literally destroying the health of the ocean. Continuing on a course of opposition to AB 376 simply makes the bill's opponents appear self-centered and opportunistic. Claim: AB 376 targets only fins, and doesn't address other shark products. Truth: This is true, but for good reason. It is the demand for shark fins that is fueling the rampant destruction of shark populations. Just as elephants were once hunted for their ivory tusks, sharks are often killled solely for their fins. If sharks were targeted for their nictitating membranes, as an imaginary example, this bill, as well we all the aforementioned legislation, would be addressing shark eye parts instead. Claim: Banning shark fins will hurt small businesses. Truth: Shark fin soup is most often served in banquet settings and at official celebratory events like a Chinese wedding. Smaller restaurants serve shark fin soup much less often than larger banquet halls do. However, to compete with larger restaurants, small restaurants often feel obliged to offer shark fin soup just in case someone requests it, lest they lost potential customers. Some restaurateurs would prefer, for philosophical or ethical reasons, not to be obligated to offer it, and some would simply prefer to avoid it since it is an expensive ingredient to stock for infrequent use. In either case, we have had proprietors tell us "just make it illegal so we don't have to sell it." AB 376 helps maintain a level playing field. Claim: AB 376 will hurt the economy and kill jobs. Truth: For those restaurants that serve it, shark fin soup is only one seldom ordered item on a menu with a plethora of other and more common choices. Even at banquets and celebrations where the soup is featured, it is only a single serving among nine or ten courses. End consumers and restaurants alike each purchase their fins from grocery stores, trading companies, and seafood suppliers which sell a myriad of other products; shark fins are far from their sole source of income. Moreover, the fins sold in California markets and shops and the fins served in California restaurants do not come from sharks caught in California (or even U.S.) waters by California or U.S. fishermen; the sharks are captured and finned by vessels all around the world, and their fins are processed elsewhere before import to California. Claim: If imports are the problem, than we should just ban imports and allow shark fins obtained from domestic fisheries to be sold. Truth: If imports were to be banned, and only domestic shark catches were used as a source for fins, it could divert an extreme amount of pressure on local sharks to meet the demand of the shark fin trade. According to the California Dept of Fish & Game, in 2009, less than 321,000 pounds of shark were landed commercially in California. Since fins represent approximately 5% of a shark's body weight, that's not really a lot compared to the fin stocks you find on California shelves, let alone those that are passing through California ports on their way to other U.S. destinations. Since locally caught supply would pale in comparison to the quantity seen in imports, the scarcity would provide disparity in the marketplace, and would likely drive prices up, further putting pressure on the local fisheries. Such situations are fertile ground for black market dealings and increased systemic abuses. Also, looking at past commercial efforts targeting shark species, one can't help but be reminded of the aptly-named soupfin shark. Epitomizing the definition of UNsustainable, the fishery collapsed as the populations were quickly decimated. That was nearly 70 years ago, and populations have still not yet recovered, and are still considered threatened. Moreover, this solution is legally infeasible; federal law and international trade rules prevent California from banning shark fin imports. Sharks around the world are in trouble as long as the shark fin trade is allowed to continue. Claim: We should allow fins to be taken from a sustainable shark fishery. Truth: The concept of sustainable shark fishing is an interesting one. Certainly, landing sharks with fins naturally attached is more desirable than finning, but it's hard to qualify a fishery as sustainable when the animals in question take so long to reach maturity, reproduce so seldom, and have so few young when they do breed. As such, they're inherently susceptible to overfishing, and nowhere is the world is there a shark fishery that's considered "sustainable." Claim: Shark fin bans are not necessary, since we already have the Federal Shark Conservation Act. Truth: While the Federal Shark Conservation Act prohibits the finning of sharks in U.S. waters, this only affects sharks caught in U.S. waters by appropriately registered vessels. This is a wonderful piece of legislation and helps protect sharks in federal jurisdictions, but, unfortunately, this has little to do with the global fin trade. As previously mentioned, the fins sold in California are culled from sharks caught in other fisheries, and are processed elsewhere before coming to the U.S. as an unidentifiable fin. Since since such a large percentage of sharks are already considered endangered, and since the practice of finning is conducted without regard to species, age, or gender, it is no surprise that even endangered species are being slaughtered. DNA sequencing of a recent sampling of fins for sale in San Francisco revealed that endangered species, such as the great hammerhead (Sphyrna mokarran), are represented on San Francisco shelves. In fact, the random sampling of fins by the The California Academy of Sciences found that one-half of the sampled fins were from threatened species. Claim: California law already bans finning - we do not need additional laws. Truth: Yes, while finning is illegal in California and U.S. waters, these are not the fins that are being consumed. Banning shark fins in California will literally help save sharks around the world. Claim: AB 376 is stringent and punitive; instead, the State should focus on education. Truth: Education and Awareness are both great. COARE maintains both among its tenets... unfortunately, in this case education is simply not enough. Relying solely on education as an approach to this problem is akin to suggesting that drugs don't have to be illegal; we could simply teach people not to use them. Granted, younger generations are more aware of the plight of the ocean, but we cannot wait for the generational shift, and we must act now. Many people are learning about sharks and this critical need for conservation as a result of this legislative effort. Claim: Most sharks are not threatened with extinction. Truth: It is easy to see how someone might make this claim, since "only" one third of all pelagic sharks are considered threatened with extinction. Only? First, the fact that one-third of the known shark species are considered threatened should give anyone pause. That is not an insignificant number - especially when you take into consideration their crucial role in the ocean. Additionally, that statistic should not be taken to suggest that the other two-thirds are abundant. In fact, the IUCN considers an additional 25% of the pelagic sharks to be "data-deficient" – meaning that we do not have enough historical or current data to assess their populations. Some of those populations may turn out to be fine, but some may also be critically endangered. To use this argument as an excuse to brazenly continue fishing with impunity is not only short-sighted, but unconscionable. Claim: Don’t ban the shark fin trade -we should ban the killing of listed endangered sharks, but allow unlisted sharks to be killed for their fins. Truth: Strict laws already protect listed sharks, yet listed and unlisted sharks are still slaughtered for their high-priced fins and the current demand trajectory for fins puts both at risk. It is impossible to identify whether a shark fin was removed from a listed or unlisted shark without costly and time-consuming DNA analysis conducted for each fin. This is not feasible, making this proposal unenforceable. Moreover, as previously noted, some sharks not yet listed as threatened may very well be in dangerous decline. One of the best ways to begin protecting sharks is to stop shark finning, and the best possible solution to curb shark finning at this point is to stem the demand through legislative bans. It comes down to this – there are two basic positions in this argument: There are people who "get it" – people who understand how important sharks are, and see how the sale of shark fins as a luxury commodity item is fueling their demise. Then there are people who simply don't yet understand the facts, the situation, or the consequences. There is arguably a third position – those who have a financial interest in the short-term slaughter of sharks and choose personal financial gain despite the societal and environmental costs... but I prefer to believe in humanity and that people are good by nature. For now, I'll continue to lump that third category in with the second, and optimistically consider them simply misinformed or misguided. Lend a hand to save some fins. Great article, Mr. Chinn, the best and most informational one I've yet seen on this contentious issue. Thanks for your considerable efforts. I'll be spreading this one around. As I'm sure you're aware, AB 376 will be voted on in the Assembly any day now, and support calls and letters are needed. Save the sharks, save the oceans, save ourselves. Excellent post! Thank you. Here's a question from opponents of AB 376 which I haven't figured how to answer: Why don't we ban all shark fishing? Any suggestions on how to address it? Outstanding and thorough piece, thanks Christopher! Good question, Yvonne, and thanks for the followup, Judy! Sharks are in serious trouble, and one day we (the general we) might, indeed, decide that ending all forms of shark fishing is a good approach. However, that's a much larger endeavor, and affects many more stakeholders, including local (and currently managed and regulated) fishing efforts. Such a grand and overarching effort would involve a disproportionate amount of buy-in relative to the animals in question. In other words, just as Judy pointed out, sharks are most often killed for their fins, and ending that demand will save many more sharks than almost any other effort. This is something we can do NOW. If you'd like another analogy, think about recycling efforts. Does it make sense to hold back a entire recycling program until you have perfected a wastestream management in place for every single item? Not at all; you start where you can, and with an effort that you think will make a difference. In fact, whether it's with newspaper, glass, cans, or PET (1) containers, all municipalities involved in recycling start somewhere, and usually later add on. That's what we're doing here. We're trying to do the most effective (and absolutely necessary) thing.